workplace recharge rooms - why are they useful? In an era filled with high stress jobs and always on tech fatigue, recharge rooms are a growing trend in workplace wellness programs. Whether presented as somewhere for stretching and yoga, a quiet room for focused bursts of concentration and productivity, as a chill-out meditation space or even a games area, recharge rooms are somewhere for workers to — you guessed it—recharge their batteries during the workday. what are the benefits of a wellness room? It may seem like an overly generous move by an employer to provide this kind of a facility for employee use during work hours but there is a lot more to it than just helping staff top up on their nightly sleep quota... Companies themselves can benefit from them just as much as the employees do. When used for brainstorming sessions for example, these rooms can boost creativity, mental clarity and overall productivity (more on the ‘how’ below). This makes them effective tools not just for forward-thinking HR departments looking to attract / retain top talent in a competitive marketplace (think tech start-ups for example) but also for Executives looking to optimize their team’s output and help individuals find their flow state in what is increasingly likely to be an open-plan office with limited privacy. Replicating the body’s circadian rhythm with smart lighting solutions means these rooms can be pre-programmed each season to replicate the effects of sunlight in the mornings, energizing blue-white light in the middle of the day and softer amber tones later on. Air-purifying plants combined with dedicated air purifiers ensure improved indoor air quality (IAQ) to reduce air-borne particle counts and remove other pollutants, helping to reduce allergies and promote cognitive function at the same time. Botanical wallpapers, artworks and nature murals can be used to bring the outside world in, replicating the effect of being outside in a natural landscape even if the office is located in a dense urban setting with limited gardens or parks nearby. Organic aromatherapy oils such as pine and rosemary can add an extra sensory dimension to the experience whilst also affecting mood and concentration levels. Advanced functional nootropics can also be added to a diffuser now, representing another level in organic biohacking. While stress and mental health disorders seem to be more abundant than ever, these recharge rooms are a modern tool to help combat what is a decidedly 21st century problem. With a plethora of benefits for both employee and business, there is a recharge room to fit just about every budget, room size and corporate culture. More research than ever suggests that a regular connection to nature is of tangible psychological and physical health benefit yet 21st century urban lifestyles mean securing a regular dose of ‘vitamin nature’ has become a genuine challenge for many. Nature-inspired biophilic design aims to remedy this disconnection by introducing nature back into interiors and the built environment through elements such as colour, patterns, textures and materials. An example of this functional health approach to design is the use of wallpapers with botanical motifs and nature wall murals, read on for our take on why they work. Whether you are looking to create calm in a waiting room, need a low-cost way to inject a huge splash of nature into your home, or want an office that promotes both health and productivity, nature-inspired wallpaper and murals are a cost-efficient solution. They’re also fairly easy to install, long-lasting, and require zero maintenance, making them especially useful for underground spaces with limited or no natural light to support plant life. Wallpapers and murals can be a great way to infuse a room with color, create a focal point, or change a room’s ambience, but did you know that this simple wall covering can also have a positive impact on your mood? A 1993 study by Dr. Roger Ulrich focused on biophilic design applied to various settings, one of which was a windowless, hospital emergency room. They traded blank walls and artificial furnishings for a design that aimed to connect people with nature through potted plants, furnishings made from natural materials, and a colorful wall mural of plants and animals in a Savannah-like setting. The result? A significant decrease in stress and aggressive behaviour among patients. Not only did the results of this study give us a glimpse of the power of a connection with nature, it showed that the positive impact can also be present when nature is indirect and merely representational, which brings us neatly back to the wallpapers and murals again! 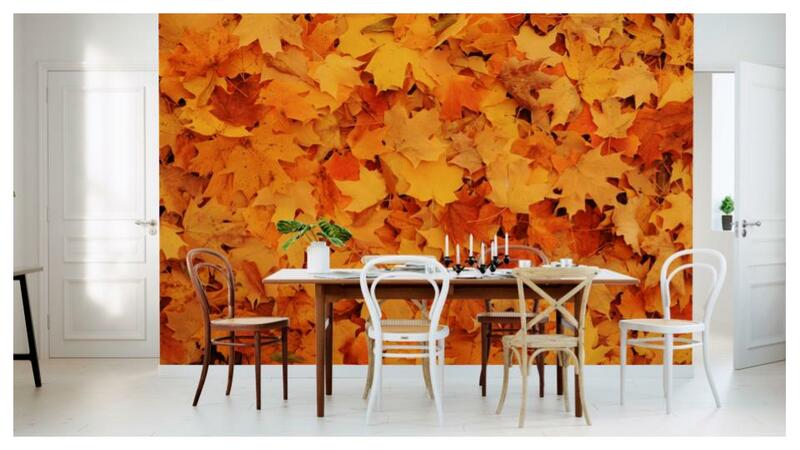 Both wallpapers and murals are suitable for home and the workplace but which one is right for you? Wallpapers tend to be cheaper, more widely available, and have more designs to choose from, they are also more representative or suggestive of nature than explicitly a scene of nature. Wall murals on the other hand depict nature in a deliberately photorealistic way—which can arguably lead to greater health benefits. Whichever option you choose, these outside of the box solutions are guaranteed to introduce a regular dose of nature back into any urban lifestyle.